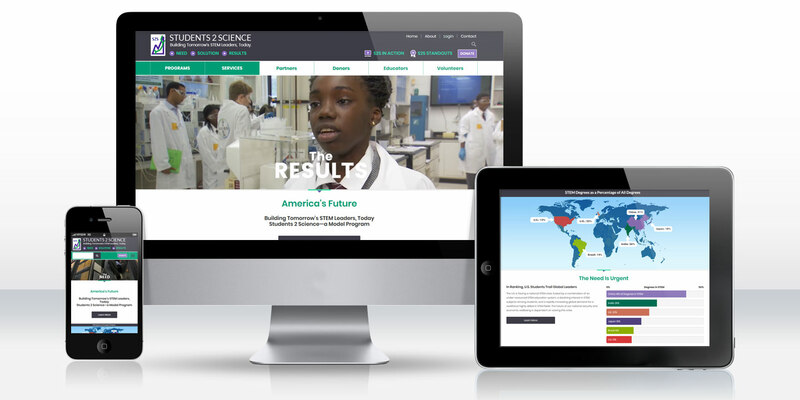 Students 2 Science shows the impact it has on students' lives while facilitating relationships with schools, volunteers, and donors that power its programs with this comprehensive custom CRM website by DDA. Students 2 Science was referred to MVP by Advanced Certification Institute, after the comprehensive eCommerce/eLearning platform developed by MVP proved itself to be a success. Their organization offered science curricula to middle and high school students designed to spark interest in STEM studies, particularly in underserved communities. Seeking to establish a totally new responsive website with a completely revised aesthetic and updated Customer Relationship Management (CRM) features, they came to MVP, which had proven itself as exemplary in coordinating high-quality graphic design with interactive programming to create richly rewarding multimedia experiences. The new website would be built on a Content Management System (CMS) to facilitate continual content development improvements. The new aesthetic would leverage the extensive amount of photography and video the organization had captured of the class laboratory experiences it offers to middle and high school children. The new site would present information in a clearer way, with defined informational pathways to provide the information needed from all prospective S2S participants: volunteers, students, teachers, school administrators, corporate contacts, and donors. DDA created a totally original homepage design, which leads with video of a middle school student offering her testimony to the value of her practical lab experience after going through her first S2S course. The homepage also features a map that demonstrates clearly the much lower percentage of graduates majoring in STEM disciplines from the US versus other major industrialized nations (both developed and developing). Looping video of S2S experiments in action comes next, followed by the various programs offered by the organization. The page ends with additional short video testimonials and a randomized scroll of the donors supporting S2S. Each section links to secondary presentation pages going into further depth into the topics, with a colorful collage of quotes, stats, and photos. The internal content is organized according to the various audiences with which S2S interacts and the programs and services it offers. The extensive custom Client Relationship Management (CRM) features set the website apart. A calendar of upcoming events is displayed to encourage users to register their class, or to volunteer to facilitate an S2S event in some way. Returning volunteers and schools are identified by email address to facilitate faster sign up for those returning to S2S. Returning schools have an opportunity to correct their data when signing up for subsequent events. The back-end administrative area allows S2S to review all volunteer and event requests and accept or reject volunteers or classes. Automatic emails go out to indicate approval and rejection of volunteer and event requests, and email templates can be developed to send mass emails and keep in touch with S2S contacts. The tool is also used to store information on past, present, and future donors. Information on volunteers, classes, schools, and donors is stored for later review. Name tags can be generated for classes based on registered rosters and volunteers. A dynamic query system is used to retrieve data filtered by time period and virtually any variable stored in the data. The final website has dramatically improved the website’s online presence, while robust new CRM features ensure that S2S operations run optimally into the future.